1. Lamb’s Chapel et al. v. Center Moriches Union Free School District, 508 U.S. 384 (1993) - School districts cannot deny churches access to school premises after-hours, if the district allowed the use of its building to other groups. 2. Good News Club v. Milford Central School, (2001) - Milford Central School cannot keep Good News Club from using its facilities because the school had created a limited public forum and prohibiting the religious club was viewpoint discrimination. 3. Widmar v. Vincent, 454 U.S. 263 (1981) - A state university cannot refuse to grant a student religious group “equal access” to facilities that are open to other student groups. Q: My father died leaving some properties to my mother and three children, including me. How can we divide up his properties? What are the respective shares? A: You and your fellow heirs can simply ask a lawyer to draw up a deed of extra-judicial settlement of your father's estate. You can then have it notarized, and then have the notice published in a newspaper of general circulation once a week for three weeks. After you pay the corresponding taxes, you can then present the deed, the notarized affidavit of publication and the official receipts, to the Register of Deeds so that new titles can be issued to your names (assuming of course that your father left real properties). Your mother gets one-half of the estate as her conjugal share. The remaining half will then be divided among your mother, you and your two other siblings. However, nothing prevents any heir from giving up his share of the inheritance or from choosing and getting a lesser amount. Thus, for example, instead of getting the farm in the province, one of the heirs may choose to get as his inheritance the brand new car. Q: How can I have my birth certificate corrected? A: For change of first name, and for correction of minor clerical errors, you can simply file an administrative petition with the Local Civil Registrar of your place of birth or residence, under Republic Act 9048, also called the "Guinigundo Law." For substantial errors, however, like errors in birthdates, gender, etc. you will still have to file the proper petition with the Regional Trial Court of the place which issued your birth certificate. Q: Can I get married to my first cousin? A: No, you cannot. You are related to your cousin by four civil degrees, and thus any such marriage is prohibited by reason of public policy (Article 38 of the Family Code). From you to your father or mother, that is one degree. From your father or mother, to your grandparents, that is another civiil degree. From your grandparents to your uncle or aunt, that is another degree. And from your uncle or aunt to your first cousin, is another degree, making a total of four degrees. Q: What is the difference between legal separation and declaration of nullity? Q: What is the difference between divorce and declaration of nullity? A: In divorce (which is non-existent in the Philippines), the grounds or reasons for such arise during the marriage. In declaration of nullity of a marriage (as provided for by the Family Code), the grounds or reasons are already existing even before the marriage, but such grounds may have manifested themselves only during the marriage. In practical effect, however, both divorce and declaration of nullity of a marriage allow the former spouses to get married again to other persons. Q: Is there any difference between annulment and declaration of nullity of marriage? A: Under Articles 35 up to 54 of the Family Code, some marriages are considered either void or voidable. Technically speaking, annulment refers to the legal action declaring void those marriages considered as voidable (that is valid until annulled). On the other hand, declaration of nullity refers to those marriages considered as void from the very beginning. In laymen's language, however, annulment is often used as a generic term for the legal action concerning both kinds of marriages. Q: My boyfriend and I are both above 21 years of age, and we want to get married, with our parents' consent. But the Local Civil Registrar won’t issue a marriage license because my boyfriend can't produce his birth certificate. What can we do? “The obvious effect of the new Rules providing that “expert opinion need not be alleged” in the petition is that there is also no need to allege the root cause of the psychological incapacity. Only experts in the fields of neurological and behavioral sciences are competent to determine the root cause of psychological incapacity. Since the new Rules do not require the petition to allege expert opinion on the psychological incapacity, it follows that there is also no need to allege in the petition the root cause of the psychological incapacity. Q: What are the effects when a marriage is declared null and void under Article 36 of the Family Code? A: Articles 50 up to 54 of the Family Code provide for the effects when a marriage is annulled or declared null and void. Among others, the children are considered as legitimate, and their presumptive legitimes must be given to them before the judgment can become final. Q: What are the rights of illegitimate children? Also, whatever a legitimate child gets in terms of inheritance, the illegitimate child is entitled to one-half. For example, if the legitimate child gets one hundred thousand pesos as his share in the inheritance, the illegitimate child gets fifty thousand pesos. Q: My husband found out that our marriage certificate is not on file with the National Statistics Office. He said that our marriage is therefore not valid, and that he can get married to another woman. Is my husband correct? A: Your husband is wrong. The lack or absence of a marriage certificate (or contract) in the files of the NSO does not make your marriage invalid. The marriage certificate (or contract) is not an essential or formal requisite for the validity of a marriage under the Family Code. The marriage certificate is a powerful documentary evidence of the existence of your marriage. Even then, however, the existence or validity of your marriage can be proven by other evidence - the marriage license, the testimony of the officiating minister and the witnesses, wedding pictures, etc. Should your husband therefore insist on getting married again, you can charge him with bigamy under the Revised Penal Code. What is the difference between adoption and simulation of birth? Adoption is the legal process by which a child becomes the legitimate child of the adopting person/s. The law which governs domestic adoption is Republic Act 8552 or the Domestic Adoption Act of 1998. Simulation of birth, on the other hand, occurs when a childless couple, for example, comes into possession of a baby or child, given to them by a midwife, an unwed mother or a relative, and this couple then applies for a birth certificate, making it appear that the baby or child is their biological offspring. 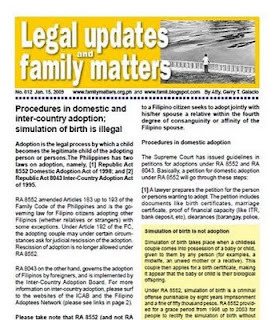 Under RA 8552, simulation of birth is a criminal offense punishable by eight years imprisonment and a fine of fifty thousand pesos.